That got me to thinking whether I’m conceited or deluded, to say that I’m now writing the best thing I’ve ever written. After all, who am I to say that anything I’ve written is worth anything? Well, years and years of experience might have something to do with it, including all those stories I wrote that turned out to be utter crap. Enough people tell you that they really enjoyed such-and-such a story or such-and-such a book or such-and-such a blog post, and you begin to see the patterns that work and those that don’t. But what if you don’t have those years of experience? Always be looking for ways to improve your craft. 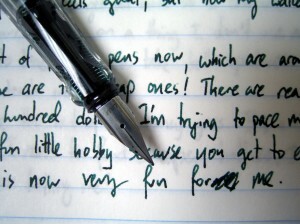 Write better and better and better, with each new piece you write. Read, read, and read some more; the best of those writers will rub off on you. Experiment with new things, new styles, new processes; keep doing what works. Write your passion, and find passion in what you write. Strive to make every new work the best thing you’ve ever written. Give yourself a pat on the back, because it probably is. I often find that my initial impressions of my own work are exactly the opposite of how I feel about it when I re-read it a year or two later. I know I’ve been writing, thinking “Wow! This is hot stuff!” and then re-reading it a year later and becoming embarrassed that I put it out where actual people could read it. Conversely, I’ve dashed off some things, thinking, “Well, this isn’t my best, but I’ve got to get it done…” and then re-reading that and been amazed at how good it was. I’ve experienced all the different combinations. Sometimes, I’ll write something and think it’s mediocre, but then it turns out to be a hit. Other times, I’ll write something I’m really passionate about, but it turns out that no one else cares. And of course, there are pieces that I wrote many years ago that I now can’t stand to read. But sometimes, I’ll write something and think it’s pretty good, and it actually is pretty good. That seems to happen more and more as I gain more and more experience. The current novel is not going well. While I’m writing, it just feels wrong. The story is powerful, but the prose feels wrong. And I read what I just wrote, and I think I’m losing my touch. But this could be one of those cases where it feels bad writing it, and it comes out great in the end, because writing it is emotionally draining, and that leaves me in no position to judge whether or not it’s worth anything. By the time I’m done editing it, if it really is the best thing I’ve ever written, maybe I’ll look back and see that it really was better than mediocre.